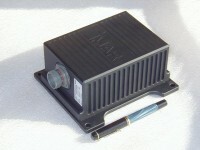 The iSSMC is a highly integrated Inertial Ship Stabilisation and Motion Control System which uses an integrated inertial measuring unit and an advanced control processor to control the fins and rudders of the ship to improve the comfort of the passengers or to stabilize a working platform on a ship. The core of the sys­tem is an inertial measuring unit which continuously deter­mines roll, pitch and change of heading (and as an option surge, sway and heave) of the ship with appropriate data rate. These data are fused together with the data of an integrated GPS receiver to control the fins and rudders or azimuth thrusters. The iSSMC provides all interfaces to control the ships actuators (hydraulic or electric torque genera­tors), to read back the actual fin and rud­der position, to provide the system status on the CDU (control and Dis­play Unit) located on the bridge and to feed in­formation via CAN to the ship’s PLC and data distribution system. As an option a WAN based data transmission channel can be made available to provide also re­mote diagnostics and service capability worldwide. Standard iSSMC can be upgraded to control up to four fins (stern, bow / starboard, port) and two rud­ders. Customer specific system configurations can be provided on request.